"Ooooh, we're three fourths theeee-eeere, wooo-oo..."
75% funded!!!! Wow! Who would’ve thought we’d hit 75% that fast? Several days ago, we were making contingency plans on how we’d deal with a failed Kickstarter campaign, but you really are a fantastic crowd! A warm thank you from all of us to all of you! - Downloadable Downloadity: Avatars. Wallpapers. A lot of people told us that our Kickstarter movie was too long and that a shorter version would help in spreading the word. We listen to what you say, so here it is: the 1:30 minute version of our Kickstarter movie. Spread it please. As much as you can. We’ll reward you with a great RPG. Note: image sizes here are constrained. Bigger JPG files available here (digital) and here (physical). Here are some interesting opinions on this Kickstarter campaign. Speaking of interesting, Swen wrote a blog post containing some of the statistics behind our campaign. GOG.com,DRM-free digital purveyor of all that's good in gaming, has announced that they will be partnering up with us for Divinity: Dragon Commander and Divinity: Original Sin. 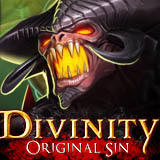 That means that if you want, you will be able to get your digital version of Divinity: Original Sin via GOG.com. They also announced that they’ll be participating in the pre-order campaign for Divinity:Dragon Commander (part of the 65$ tier here on Kickstarter) and to promote it, they will host a live Google+ Hangout On Air Q&A session on Wednesday, 10 April 2013 at 2:00 GMT (10:00 AM EDT), which will reveal new gameplay footage from Divinity: Dragon Commander. Now that you can visually tell what rewards you get for what tier, maybe some of you are going to make the jump to a physical tier? In that case, sing along to this! If not: sing along anyway! @Larian Studios LLC - Oops...sorry about that! Just checked the homepage and there is indeed a list of add-ons at the very bottom of the page. I've upgraded from the $40 tier to the $65 tier after confirmation that we get 2x OS and 1x dragon commander. I don't think I understand the "we're waiting for GOG pre-orders before adding Dragon Commander as an add-on" logic. The only reason to wait would be if something was not definite about that option, otherwise just put it in now and sort it out later (right?). Maybe I haven't had enough caffeine yet to see... I'm not saying necessarily that I'd upgrade, but I'd definitely be more interested if I could get that at a higher tier (currently at 65). @Dan Yup, David confirmed it below... we get 2 copies of Original Sin plus 1 copy of Dragon Commander. In the digital chart where is there a "2x" in "The game" reward row for pledges 40 and up? I am currently pleding for 65. Does that mean I'll get 2 copies of the main game? @Edgardo - That will happen after GoG starts taking pre-orders for Dragon Commander in about a week. @Helena, thank you for the tip, much appreciated! Hadn't read that update yet. @All: We actually already included add-ons (on the main page), but I guess we need to make them more prominently visible. @Tom: you can add an extra digital copy of the game by adding $20 to your pledge (see update no. 1). To encourage some people to give you more money have you thought about having certain items as separate add-ons, e.g. a copy of Dragon Commander? You could then have an add-on page as a separate update which includes all the items people might want. Then get them to stick to their desired reward level, but up their pledge amount and after the Kickstarter ends you could set up a website for people to redeem their add-ons. This way, you get more money and people have more control over what they get...everybody wins! Check out Kickstarters like Project Eternity for an idea as to how to implement this. @Larian - Since you are in communication with GOG, can you see if they will also carry the Linux versions if they become available. I know GOG does not officially support Linux right now, but maybe they would still be able to unofficially host them also. I'd rather not use Steam for my DRM free titles. Project Eternity, Torment, and Divinity have Linux versions now. All three will be hosted by GOG. They really need to support Linux, even if only on a basic level. Is it possible to combine two tiers? For example the $150 tier and a $25/$35 tier? I'm very interested in the $150 tier (to complete my Larian "limited edition box" collection, Belgian pride! ), but then I'd lose one of the 2 digital downloads of the $40 tier pledge I already made. I'm guessing this isn't possible without making 2 kickstarter accounts, or am I wrong? Upvote for more visibility, guys. LOL @ that video. Congratulations Larian, you've convinced me to upgrade to the $65 tier. Great short video. And I Just love that theme music. + Everyone should go to you tube and press the like button, of course. Hi! In your previous update you have said the following: "If you pledge $75 and up, you will receive the digital artbook and a digital version of the map along with your rewards". But in the matrix the digital artbook is available to $75 reward only. What is correct? Official: the $65 digital reward tier is 2x DOS + 1x Dragon Commander. Very good video. This should definitely work as KS teaser. Nice job! Ekster: I need to double-check this with Swen... Maybe I answered too fast. I'll be upgrading to the $65 tier. 2 x DO:S + 1 x DC = no-brainer. ok, so in celebration of this wonderful event (and after checking the $ to € exchange rate) i have upped my pledge to get a boxed copy of the game, w00t!! (it would be great though if you could send the box from europe, first because of postage, second because of delivery time and third, very important: because of import taxes and customs... i don't want the package to sit at customs for several weeks) - anyway, congrats on hitting the 300k mark :)! Just to make sure, the $65 Dragon Commander actually contains two Original Sin and the Dragon Commander game? If its' really 2 Original Sin and 1 DC, then I will be definitely moving up to that tier! @ Galaad : we will add Dragon Commander as an add-on as soon as Dragon Commander pre-sales go live. I'm glad it seems to be going at a nice pace. Would love to see just how awesome it can turn out. And that is where I leart about the Kickstarter campaign from. Just one point - reward matrix dont incluse UPD1 pledges (for example, add 50$ to get alpha test etc), maybe make another additional table? So at $65 (digital) you get 2x DOS and 1x DC ?